You can see how the construction of the resort is progressing in this video. We’re changing and shaping the way healthcare is being delivered to the DFW Metroplex. We will offer both assisted living and rehabilitation services to our guests. If you need our services for rehabilitation, our medical professionals will help you get back to your everyday life as quickly as possible. Our variety of services include: physical therapy, occupational therapy, speech therapy, massage therapy, 24-hour extensive skilled-nursing care, and more. Our in-house therapists are dedicated to getting to know you and your needs. For our guests who will look to the resort as a housing solution, we empower you to maintain the standard of living you upheld in your own home. Our residences are new, private, fresh and elegant. It is the perfect environment to feel secure and comfortable knowing that help is always there when needed. We are creating a wealth of fun common areas so that residents, family, and friends feel like they are all part of a neighborhood. All of our guests will be able to enjoy a variety of amenities. Stop by the full-service salon and spa for a haircut or catch a movie in our theater. Celebrate special occasions in our private dining room or tell stories around the fire pit in the outdoor courtyard. Guests can also sample a variety of dining options, including restaurant-style dining, a pub, and a bistro-café for coffee and snacks. We want your time with us to be pleasant and enjoyable. 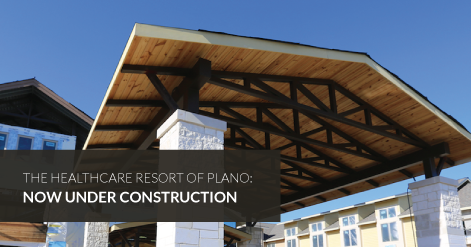 While The Healthcare Resort of Plano will offer world-class healthcare in five-star luxury, we want to be able to serve the community as a whole, not just an exclusive part of the community. “We feel like everybody deserves this level of customer service and healthcare in whatever community we’re in,” says Eric Gillis, vice president of new market development. Hear how the resorts bring something different to healthcare from some members of our team. If you have any questions about the resort, you can call us at (469) 404-7809 or email us at plano@thehealthcareresort.com. Keep in touch with us on Facebook, Twitter or Google+.